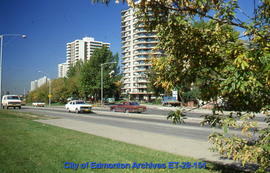 Looking north from Victoria Park Road towards Oliver. Under pedway across 101 Street at City Centre Mall. 101 Street From Jasper Avenue at Christmas Time. Taken at 9:25 P.M.
11635-91 Street - scene of murder-suicide. 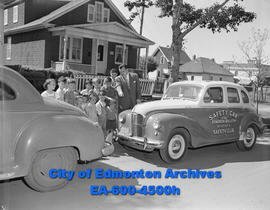 1948 Pontac won by Fred A. Sawchuk at the Edmonton Exhibition. A vintage car used in the anniversary parade. Looking north, Includes Commercial Cafe and the Canadian National Railways Block.